Windermere appears centre left at the southern end of Rydale with its southern reaches apparently split off by Claife Heights. Esthwaite Water can be seen to its right. Morecambe Bay is in the distance. Heron Pike stands just right of centre with the ridge leading right to Great Rigg. Coniston Water can bee seen through the gap. 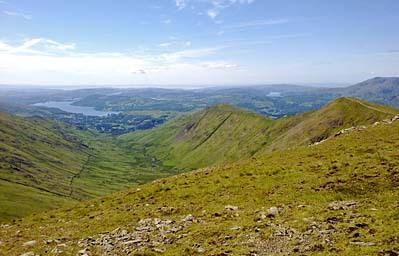 Coniston Old Man and Brim Fell are on the horizon to the extreme right of the picture. Larger version of this picture.